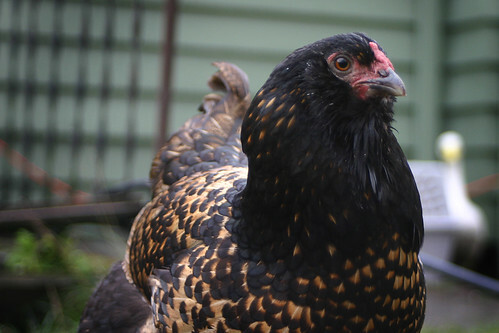 Olivia hen passed away peacefully in my arms on the morning of December 17, 2014. She was rescued in 2009 and reportedly born in 2001, which made her about 13 years and 8-9 months old. This is the story of her life. 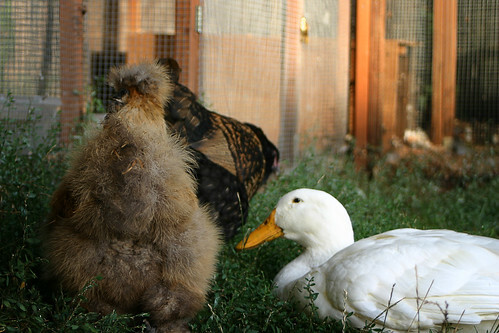 In 2009, we took in Olivia hen, Racquel L’Oreal hen and a handicapped duck named Sunny. 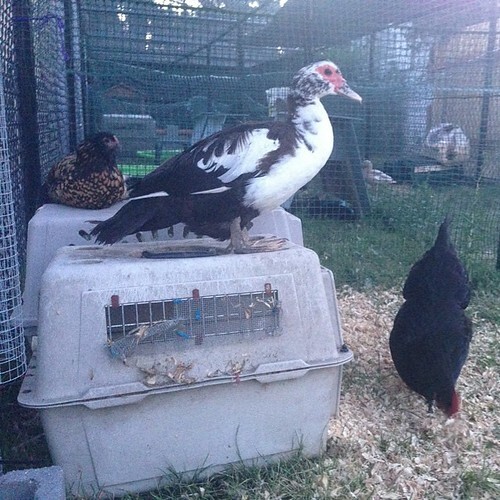 We were asked to take in the duck, but we agreed to take the chickens too when we saw their living situation. They were kept safe, but in a hot dark shed. Their caretaker was injured and having difficulty caring for them while recovering. 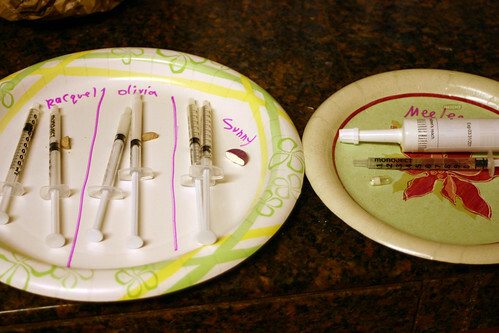 All three had multiple parasites, and Racquel L’Oreal and Olivia had respiratory infections. 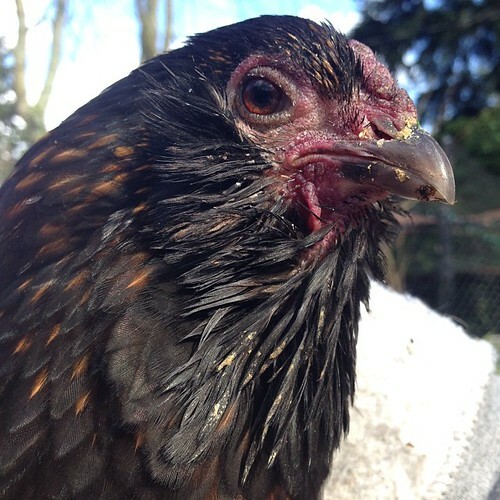 Racquel also had a prolapse and GI tract inflammation. They were a mess, but it was Sunny who was worst of all. Sunny had a badly healed previous injury that left her unable to walk or move well. 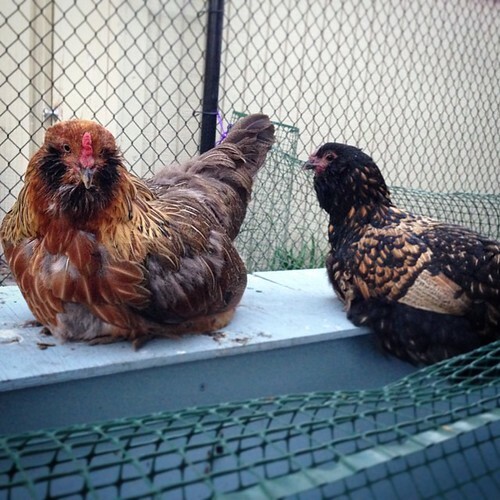 But her chickens loved and adored her. Here Olivia cleans her face for her. Sunny broke my heart. 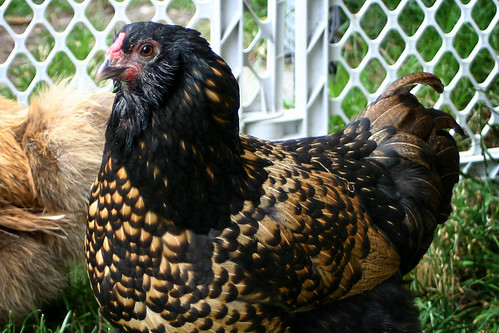 In her previous home, she was in a small shed with her two chickens. 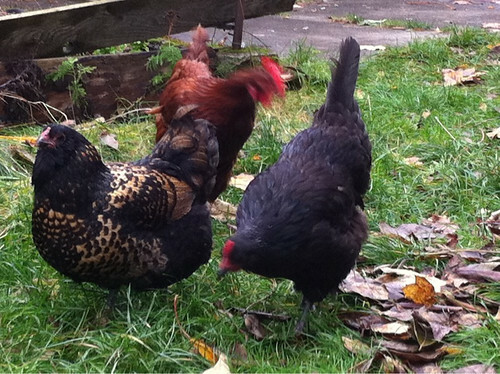 But at our house, the chickens quickly learned to love the grass and loved to roam around and hunt for bugs. 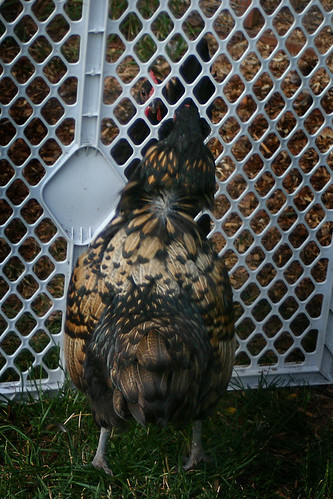 Because Sunny was handicapped and couldn’t walk, she would cry and cry for her chickens to come back to her. She didn’t like them to be away from her side, but they wanted to roam and play. We kept Sunny on pain medication for a while, but unfortunately we decided to euthanize her when her quality of life deteriorated. 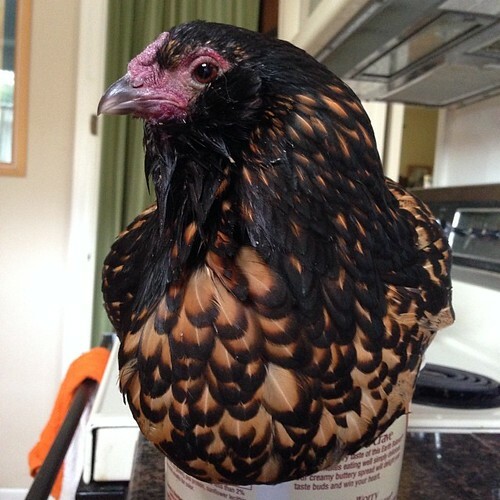 She couldn’t move well-enough to keep herself fed and watered during the day, and I’d often come home from work and find her stuck in her water dish or in the same spot she’d been in all day long. It was a very sad time. Racquel and Olivia did well after saying goodbye to their duck friend Sunny, and they stuck close together in the yard. 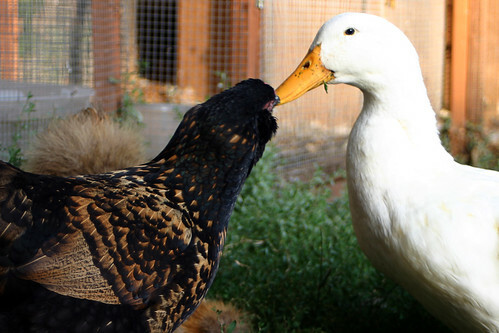 They both took a liking to Chewy duck, and would hang out with him and Flapper in one side of the aviary while the muscovy ducks shared the other side. 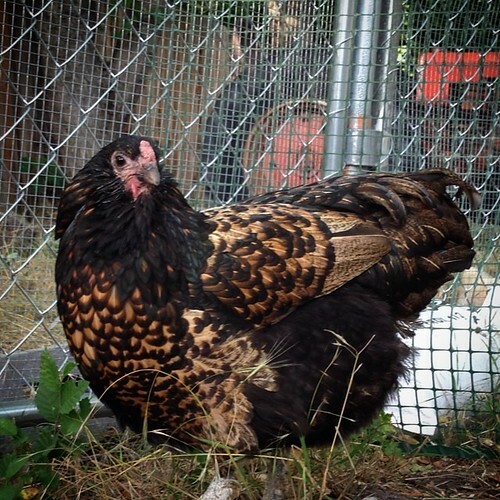 Olivia was a beautiful little chicken with golden-laced feathers. 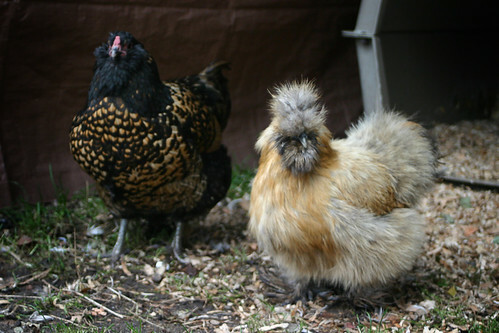 She was a protector to her fuzzy muppet friend Racquel L’Oreal. 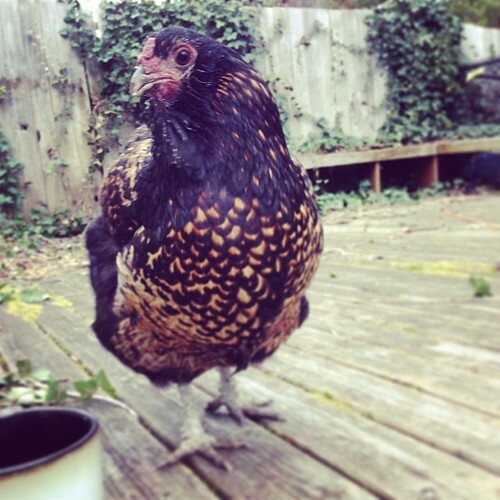 Back then, she was a pretty serious little hen, and very business-like. She wasn’t too affectionate for a long time, but she did learn to talk to me for treats. She was a good conversationalist. 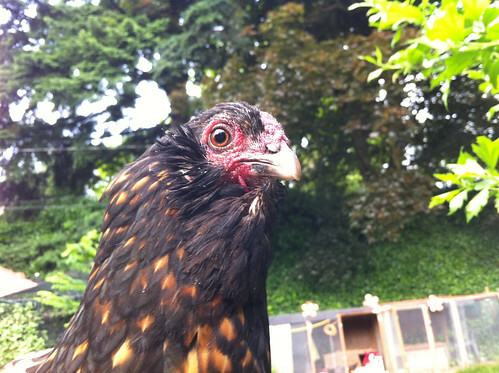 When Olivia’s friend Racquel passed away of old age in June 2010, we soon took in two new rescued chickens to keep her company, Janet and Olly Astro. I thought Olivia would like the company of new friends, but she spent several months threatening them through a fence before she let down her guard. 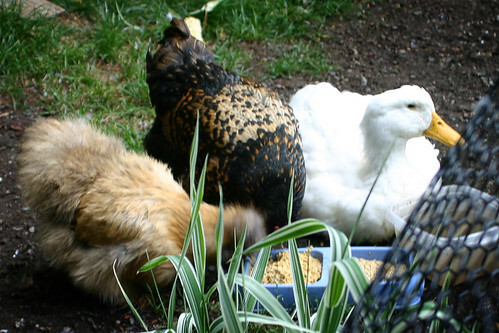 Olivia eventually learned to tolerate Janet and Olly Astro, as long as they let her be top chicken. 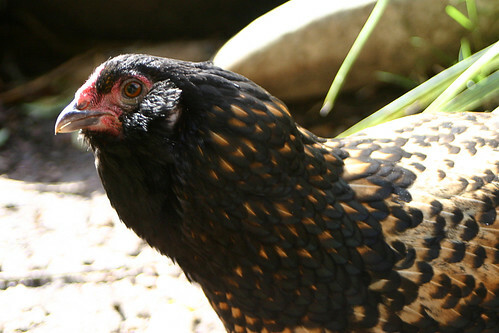 Olivia was over 8-years-old when she came to us, but she still laid an egg every now and then. I could always tell her eggs because they were tiny. 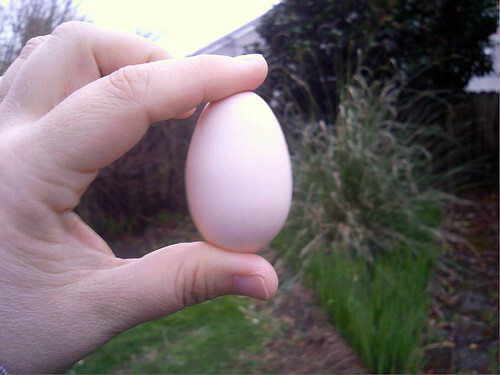 Even this past year at age 13 she laid one single egg. 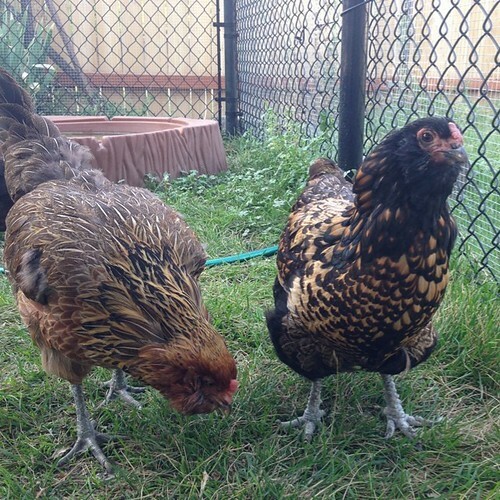 Over the years, Olivia lost her spot as top chicken as new rescued hens came along. Janet passed away, Carol hen and Cindy Buttons came on the scene. 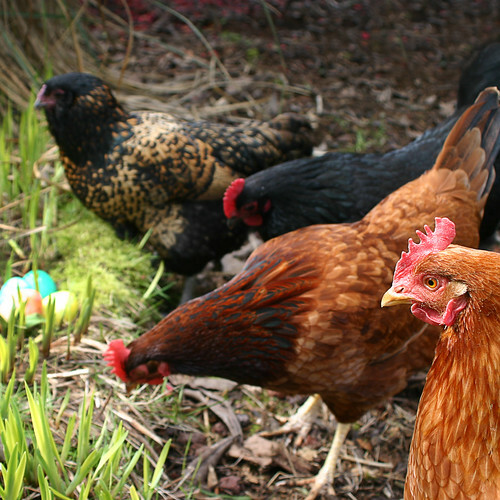 For a while the four hens did well together, as long as everyone stayed out of Carol’s way. As Olivia aged, she let me care for her more and more. 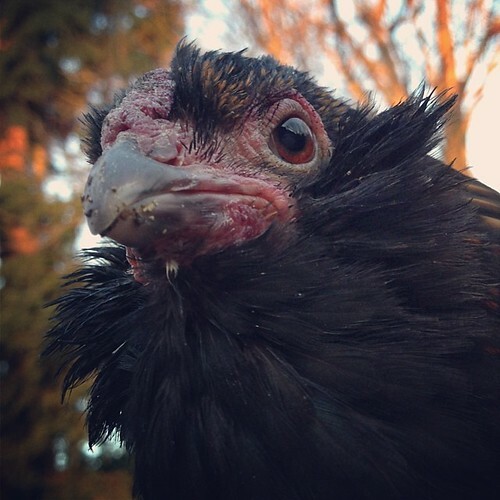 One year she ended up with leg mites since she couldn’t perch any longer (she was too old to jump up high). She let me treat her legs and feet after that, and even seemed to enjoy the special care. Olivia was never particularly affectionate, but she did let me hold her once in a while. I was a little concerned about how this old girl would make the transition from Seattle to Salt Lake City, but she traveled like a champ. Olivia liked the new aviary, especially since it has so many places to stay away from Carol. 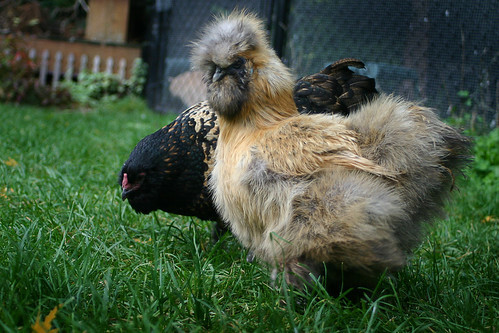 Olivia’s most recent close friend was Si, our rescued hen who passed away in October. Si and Olivia spent a lot of time together over the summer and really liked each other. 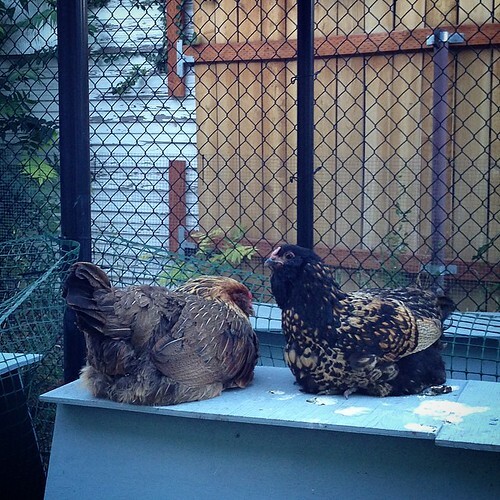 They would sleep and perch together each night. And Olivia would take care of Si and preen her face. I think Olivia knew that Si was old and would soon pass away. She was always very gentle with her. In Olivia’s final week, I brought her inside to keep her warm and well-fed. I knew she was slowing down but she was so lively and perky that I thought she might have more time left. On her last evening, she was vigorously eating tortilla treats with me. At 6:20am the next morning she was passing on. While it is never easy to say goodbye, it is always easier when a rescue lives a good long healthy life and doesn’t suffer. 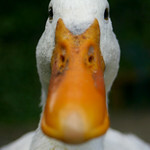 Olivia would want her life to be celebrated, because she was a grand old dame. This New Orleans funeral march seems perfect for her, and I like to imagine her strutting along on her way to whatever is next for her.